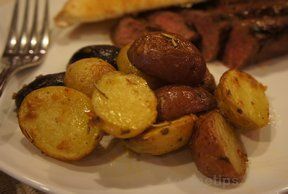 With sharp knife, slice potatoes thinly but not all the way through, leaving slices attached at the bottom. 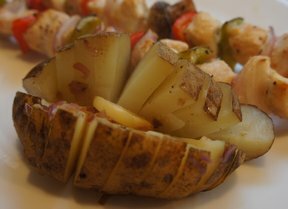 Place potatoes in greased shallow baking dish. Sprinkle with salt; brush with 1/4 cup melted butter. Bake uncovered at 425° for 30 minutes. 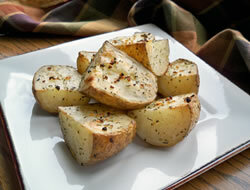 Brush potatoes with remaining butter and sprinkle with bread crumbs. Bake 20 minutes longer. Sprinkle with parmesan cheese. Bake 5 - 10 minutes more or until potatoes are tender and golden brown.